Home Page > Blog > Breastfeeding T-shirts - a solution for nursing mothers. Cotton blouses in large and small sizes! Breastfeeding T-shirts - a solution for nursing mothers. Cotton blouses in large and small sizes! T-shirts for nursing mothers - what is their secret? Breastfeeding T-shirts and other clothes that have been loved by thousands of nursing mothers! Breastfeeding T-shirts are an extraordinary facility that has increased awareness about the natural needs of mothers and their babies. Once to feed a child, one had to find a secluded place, pull off all possible layers of clothes and hurry, often in unfavorable conditions and an inconvenient position, to latch the baby. Moms have often chosen not very friendly, small bathrooms and tiny places to feed their child without having to bear unpleasant comments or malicious whispers. Many people see this as a natural turn of events, but we assure you that there is absolutely nothing natural in hiding while breastfeeding. Let's think for a moment - what man would like to eat his delicious dinner in a dingy, public bathroom? And in a hurry with unnecessary stress, which also stresses out the toddler while his mother is upset? Often the nerves and stress in nursing mothers reach so high that women completely give up breastfeeding in public places. This is due to the paralyzing shame of exposing yourself to strangers. There are times when in spite of the excess of food that made the breasts hurt, we decided to feed the baby with a bottle. And all this to avoid exposing yourself to random looks and possible nasty comments. Luckily today times have completely changed - thanks to clothes that make it easy to breastfeed, every mom can do it comfortably and stress-free without having to face the condemning frowns of pedestrians. Breastfeeding process is so natural that no one should throw unfavorable words and rather congratulate the brave mother, it is easy to come across some hurtful words in a loud restaurant or a shopping mall full of people. Especially for the sake of mom's greater courage a series of breastfeeding clothes has been designed so that you can quickly and comfortably feed your baby. Passers-by will probably not even notice that the baby is breast-fed - the highest level of intimacy and discretion is guaranteed at this specially made garment. And if they notice anything, it will be only a baby cuddled to its mum instead of accidentally exposed parts of her body. Most women who latch their toddlers, only identify clothing that facilitates this particularly important process, with the shirts and bras for breastfeeding. Meanwhile, there are various types of comfortable, well-made and fashionable clothes that will not only refresh the wardrobe of each mom, but will also help with the daily breastfeeding process. What is particularly important, the clothes for breastfeeding have been designed in such a way that their actual purpose remains a secret to outsiders. 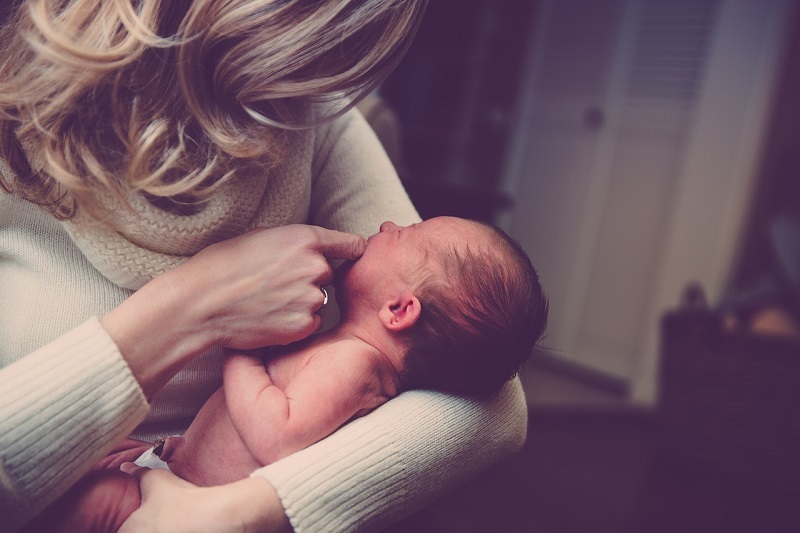 Functions that make it easier to latch your baby are imperceptible to outsiders - it means that you can wear this type of dress, blouse, and other clothes even if you do not take your baby with you or after the end the natural feeding process. Among breastfeeding clothes you can find not only light, colorful t-shirts, but also the warm, buttoned sweatshirts, summer and winter dresses, or elegant and stylish blouses which made breastfeeding at official celebrations and family occasions not a problem anymore. If you are wondering what is the difference between a normal t-shirt and the one designed specifically for breastfeeding and other t-shirts available on the market, we are eager to respond! Usually, to feed your toddler, you have to pull up or stretch your top so that you can easily reach the cups of your bra. This way we have one of two impractical possibilities to choose from: we either show more body than we want or we stretch our shirt too much. In the first case, we also need to remember to keep the loose t-shirt tucked up with your hands and to ensure that the fabric does not fall on the baby or cover the breast. But when we are forced to stretch the fabric of the shirt so that the toddler has access to the breast through the neckline, our outfits after a few of these types of breastfeeding lose their original shape. Many times I hear moms complaining that after breastfeeding they had to replace their entire wardrobe, including their favorite clothes, because they became too stretched and unattractive to wear. Of course, you can prepare a number of clothes that you do not care about, and use them while breastfeeding. But what to do when we are going out with friends, have an evening dinner or a festive family gathering? For women who want to end the stereotype of a thin, tired mom walking only in sweatwear and loose shirts, we have a better option! And these are specially designed t-shirts that have a special, hidden layer from of fabric. This means that from the outside we are dealing with a good quality t-shirt, which catches the eye with an interesting pattern or imprint. The secret lies in te extra bottom layer, in the form of a soft and extremely flexible top. All you need to do is pull up the top layer and feed the baby through the wide armholes. Your belly and bust remain hidden, while you can enjoy a comfortable, unhindered contact with the baby without the risk of someone making a loud comment about the situation. Comfortable, stylish and discreet! Fall in love with the amazing quality of Mamatu breastfeeding t-shirts! Mamatu online store with clothing for children and adults has great assortment offers in the form of t-shirts for nursing women, there we can find, among other things, stylish outfits for toddlers of all ages. There are perfect shorts for children, tiny sweatshirts, children's jackets, rompers or sets of caps, headscarfs and chimney scarfs. You can also choose from dresses and skirts and warm winter leggings. In the assortment there are also outfits for moms and daddies – in colors that match the clothes designed for the toddler, so if you're looking for perfect parents' clothes, you could not find a better place! Another category of clothing at Mamatu store is the, mentioned before, clothing for breastfeeding mothers. We can choose among stylish dresses in smart and sporty versions (You can even find there the famous little black dress! ), Fashionable and comfortable hoodies, which specially sewn-in zippers that help you feed the baby quickly and without having to take off or pull up all your clothes, and elegant blouses that will work perfectly at a baptism or communion. There is also a wide selection of breastfeeding t-shirts that will refresh every wardrobe and will work well as a base for a fresh, youthful look. Importantly, Mamatu t-shirts, blouses and other maternity clothing are designed in a way that makes it impossible for people to say that the clothing is designed to feed babies. Their patterns, shapes, excellent durability and discreet breastfeeding options make Mamatu clothes wearable even long after the end of breastfeeding! This way, we gain an original and stylish wardrobe, which will serve us for the next years! When creating the assortment of Mamatu online store, we focus primarily on the highest quality of our clothes. We are not content with half-measures - we test and very carefully consider the choice of each raw fabric used in sewing the garments with the name of our company. All fabrics and knitwear used in the production of Mamatu clothing come from reliable local producers. We care about the natural environment, which is why we do not decide on a long-distance, carbon-free transport. We prefer to focus on local suppliers, and thanks to this we are able to accurately verify the quality of fabrics. 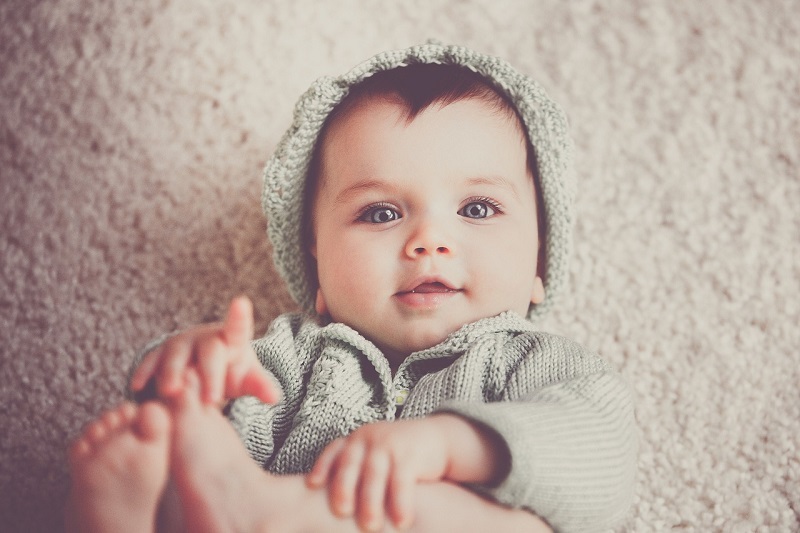 Knitted fabrics used to create Mamatu clothes are completely safe for the health of children's delicate skin. They have the Oeko-Tex Standard 100 Certificate of Trustworthy Textiles. What does this mean? Are you looking for breastfeeding t-shirts? Choose those with a confirmed quality certificate! All clothing that comes in contact with the delicate skin of children (including the breastfeeding t-shirts) must be completely safe for their health. Of course, clothes for adults should also be carefully verified in terms of the raw fabrics used and their level of toxicity - no one wants to get an allergy from a new sweater or irritation after putting on newly purchased underwear. To be fully aware of the purchase, the product parameters should be carefully verified. If we find out that the clothing is Oeko-Tex Standard 100 certified, we can sleep in peace. Oeko-Tex Standard 100 is a comprehensive certification system for textile products that are tested at all stages of production and processing. Thanks to the mark, consumers are certain that they acquire a product that is completely free of any chemical substances that may have a toxic effect on their health. This includes, among others, pesticides, chlorophenols, formaldehyde, azo dyes and any other allergenic substances or extractable heavy metals. The Textile Institute of Lódź is responsible for the certification of the Oeko-Tex Standard 100 in Poland. If the product has been marked with this certificate, it means that it meets the requirements resulting from the provisions of Polish law, referring to the level of security of textiles. In addition, the product must comply with the assumptions resulting from Annex XVII of REACH, i.e. restrictions on the manufacture, marketing and use of certain dangerous substances, substances, and products. The Oeko-Tex certificate also assumes compliance with the American ICPSIA standards for lead content in products dedicated to children. What can we be sure about when buying Oeko-Tex Standard 100 certified clothing? In order for a breastfeeding t-shirt or any other product to qualify for the Oeko-Tex Standard 100 certificate, it must be subjected to many professional tests carried out in specialized laboratories. Both the damages which the substances used in the production could cause to a human being in contact with the skin, as well as the risks resulting from inhalation or contact with saliva are taken into account. This last parameter is extremely important when examining clothing dedicated to young children - all because of the tendency of children to put various items in their mouth. chlorinated aromatic compounds in the form of benzenes and toluene. In addition to verification of the presence of the above-mentioned toxins, the fabrics applying for the certificate also undergo a series of tests regarding their color, scent, pH value, organotin compounds (DBT, TPhT, and TBT) and emissions of volatile compounds. In order for the selected textiles to be able to obtain the Oeko-Tex Standard certificate, they must meet absolutely all safety criteria. Looking for breastfeeding t-shirts? We offer small and large sizes! We are perfectly aware that our clients have many different sizes and shapes. For this reason, our t-shirts are always available in several sizes so that each one of you can find the perfect model for you! We always try to meet even the most exorbitant expectations. The exact size of each of our outfits can be found on our website, so you can make the most optimal and satisfying choice before placing your order. In the case of the t-shirt, we give both the dimensions of the outer layer and the underlying inner layer so you can be sure that the t-shirt you choose will entirely meet all of your expectations. However, please note that all copies of Mamatu clothes (and not only the ones for breastfeeding) are hand-made, which means that the models may slightly differ from each otherhowever, this is always a difference no greater than 0.5 cm to 1 cm. Thanks to the individual approach to each of our clothes, we make sure that our clothes are original, unique garments and are created by direct involvement in the projects. There are both S, M, L, and XL T-shirts available at the store, so every woman can choose the one that best matches her figure. Importantly, if it turns out that the chosen size is not appropriate, Mamatu offers a refund or replacement within 14 days of purchase. 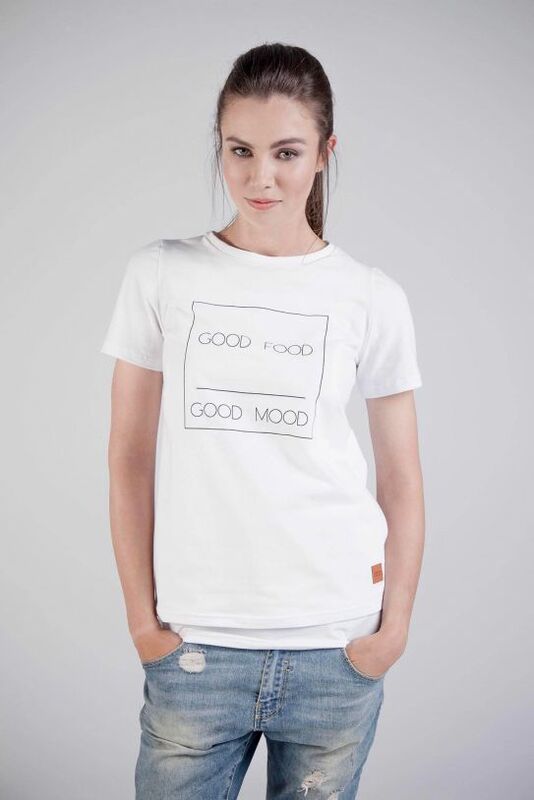 A great offer for breastfeeding mothers is a practical white blouse with the words GOOD FOOD - GOOD MOOD on front. It's a blouse that presents itself perfectly well as a summer dress to wear with shorts or a comfortable skirt, as well as a base layer for cooler months, going well with jeans and a long black sweater. Thanks to the color and economy of design, it is a classic piece, but it has a catchy slogan ("good food - good mood"), which jokingly points out that the blouse is intended for breastfeeding. This baby blouse was born from the real need of a Mamatu-mom who thought the world would be a much nicer place if tiny babies could be fed quickly and stress-free, even when we were in a public place. Good food given in favorable conditions is a guarantee of good humor - both for the mother and the baby. The white blouse is made of the highest quality Polish knitwear, which does not cause problems with excessive piling, and because of that they are perfect for washing. All thanks to their composition, which consists of 94% cotton, the blouse is soft, breathable and pleasant to the touch, and 6% elastane, that enables it to look flawlessly on every type of figure. The real hit of every wardrobe, the khaki t-shirt is a full of thermo-applications outfit that perfectly blends the distant shade of dark green with colorful and cheerful prints. It goes perfectly with grunge style clothes, punctured jeans or black tube pants. Feel free to wear a pair of colorful sneakers! It gives women a bold urban look and at the same time it can attract baby's attention with various colorful applications. This shirt is also great for large, caps, which we have in versions with funny inscriptions and ones with a completely smooth design. The t-shirt was made exclusively from Polish, local fabrics and was sewn by Polish seamstresses in our native sewing rooms. The excellent quality composition consists of 94% cotton and 6% elastane, which allows the t-shirt to fit nicely on the bust and hips emphasizing the natural assets of the figure and masking its imperfections. The t-shirt is comfortable for both the mother's skin and the delicate skin of her baby. The quality and safety of the T-shirt is testified by the Oeko-Tex Standard 100 Trusted Textile. This is a well-known and appreciated symbol throughout the world, as a proof of the safety of the textile product. It proves that no substance is considered to be potentially harmful to our health. The full list contains more than 100 items and can be found on the official website of the Łódź Textile Institute. Research on products seeking Oeko-Tex Certificates are conducted by authorized independent research institutes. The Mamatu breastfeeding clothes, including the khaki breastfeeding t-shirt, are Oeko-Tex certified, so that no mum needs to worry about the contact of the delicate baby skin with our products. Soft, safe, ecological! You can also wear our dreamcatcher t-shirt with standard jeans, loose shorts, and long skirts. This unusual t-shirt in a warm shade of sand is especially suited to the admirers of original designs and boho-style clothing. It looks good combined with a wide blanket-like scarf and a large bag with a hippie design or a cheerful patchwork. The advantage of such a bag is the ability to put inside any accessories necessary for a toddler during a stroll. The light yellow t-shirt for breastfeeding is an example of unusual clothing and no one would suspect that it has hidden solutions to help breastfeeding. But just under the first layer of fabric with a delicate decoration in the shape of an Indian Dream Catcher, we find an elastic top in the same shade. Just like with the other Mamatu t-shirts, lift up the main layer and comfortably move the top to gain free access to the breast. This makes the mom's body barely exposed, giving her the desired comfort and discretion. If you are constantly missing the sunny months of holidays, express it with the help of our Hello Summer t-shirt! This extremely comfortable T-shirt is a combination of comfort during breastfeeding your child and a stylish, minimalist design that has been a real trend among women's t-shirts for several seasons. This is a t-shirt offer, thanks to which every mother can have her memories of summer with her! Regardless of whether there is an autumn rain outside the window, we go somewhere in the middle of winter or welcome the first rays of the spring sun together with our toddler - in a t-shirt with cheerful graphics each mom has a holiday vibe around her. This is a guarantee of a good mood for both you and those around you! Gray, uniform color makes it look great in combination with other clothes, so do not hesitate to grab a cardigan or a large sweater if you want to put it on it on colder days. The Hello Summer T-shirt with a merry pineapple graphic instead of "o" will be perfect for pierced jeans, tube trousers, and black dungarees. In the summer you can choose a girly skirt and sandals, gaining a delicate look, perfect for an afternoon walk or a trip to a shopping mall. This offer from the Mamatu breastfeeding collection is also an amazing treat for all mothers who would like to buy a set of identical things for themselves and their babies. The identical t-shirt design occurs in our offer of children's T-shirts! Its cut is so basic that it was assigned to both boys and girls in the store. So if you dream of identical mother and daughter clothes, or would like to please your son, when you go out together and dress in a similar way, do not hesitate for a second! The same clothes for a mother and a child during a family meeting or a social getaway to the city will awaken a huge amount of positive emotions among friends, family, and completely unknown passers-by. In addition, they will be great fun for the child who will feel honored. In the end, which child does not dream of being as wise and brave as his parents! Thanks to the same t-shirts with the Hello Summer graphics, you will make the summer come to you sooner! When choosing the perfect size, remember that every copy of Mamatu clothing is hand-made. For this reason, the actual size of our clothes may slightly differ from the dimensions given in the magazine. There are differences oscillating around 0.5-1cm. 5 reasons why breastfeeding t-shirts are an absolute must-have in the wardrobe of every mother! Breastfeeding t-shirts are very often not the first necessity that women with a due date of delivery think of. Completing the layette, remember about baby clothes, thousands of various accessories used for feeding, changing and entertaining a baby, as well as a breast pump and teas that help maintain food production. When planning a list of expenses, they think that they should somehow be prepared for the breastfeeding time, a bra with cups for easy breastfeeding and a comfortable nightgown goes to the basket. With such a huge amount of expenses is difficult to think about a completely new wardrobe. More than one mother has a thought like "Is a breastfeeding t-shirt essential? Maybe I can manage without it? " Especially in the event of this type of doubt, we present to you 5 reasons why T-shirts and other Mamatu breastfeeding clothes are an absolute must-have in the wardrobe of every young mom! All Mamatu breastfeeding clothes - with t-shirts in the first line - have been made in a way that ensures maximum comfort for women wearing them. Our products do not oppress any parts of the body, arranging the fabric beautifully. Forget about uncomfortable seams or tight sleeves. Mamatu t-shirts are soft and pleasant to the touch, they do not get static and they are just so comfortable to wear! Breastfeeding t-shirts are not only helping you with your daily routines but also look good. Thanks to the large size range of our clothes, every woman is able to find something that matches her figure. We create clothing that emphasizes the natural qualities of the figure and masks its imperfections, eg. in the form of a belly after pregnancy. Thanks to this, the vision of wearing clothes resembling tents and sails carried by the wind of the ship goes into oblivion. What counts are interesting, well-made garments in which you can feel confident and feminine in every situation! When choosing fabrics used to create our clothes, we are ruthless - either quality or nothing. For this reason, Mamatu clothes keep their original shape for a long time and do not tend to lose color. You will not notice small pills s or abrasions on them. Our fabrics come exclusively from Polish producers, thanks to which we are able to carefully control their quality. Note: if you want Mamatu clothes to serve you for long seasons, remember to wash and iron them only inside out. Thanks to this you will enjoy great quality clothing that will stay with you for many years. After full sacrifices during pregnancy, which is associated with a real revolution and changes practically the entire wardrobe of a young mother, it's time for a change. The stereotype of a scruffy woman, suffering from chronic lack of time and with a child in her arms goes to oblivion. Today, more and more women who have small children still want to feel feminine and stylish. It was for such conscious moms that Mamatu breastfeeding clothes were created. In addition to extremely discreet features facilitating breastfeeding, they also offer attractive shape and interesting design that will leave them in your wardrobe even after breastfeeding! Every item in the assortment of Mamatu online store is the effect of manual work of extremely talented, Polish dressmakers. Individual copies are hand-cut, which means that you will not find two identical dresses or t-shirts in the offer! Each of them is a unique and original project. So if you are looking for clothes "with a soul", you found the right place!